Which team is the dominant force in London right now? 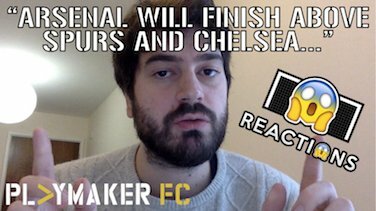 Despite Spurs’ emphatic dismantling of Chelsea last night, Playmaker FC’s Tom Skinner has made his case for why he thinks Arsenal will finish above both of them come May. He believes his controversial prediction baring any fruit hinges on whether or not Spurs remain in the Champions League, claiming their lack of squad depth will become problematic if it is forced to operate within the bloated format of the Europa League. Unai Emery on the other hand, has proven time and time again that he has what it takes to manage the harsh demands of “the Champions League’s less-prestigious little brother”, winning it three times in a row between 2014-2016. As for Chelsea, he believes it is their lack of an in-form recognised striker that will see Arsenal, boasting a frontline of Pierre-Emerick Aubameyang and Alexandre Lacazette, usurp them in the table over the course of 38 games. Not convinced? Check out the video above and have your say!